“Liquid gold” as known as breast milk is the natural way of providing energy and nutrients to young infants for healthy growth and development. World Heath Organization (WHO) recommends breastfeeding particularly colostrum (breast milk produced at the end of pregnancy) to new born within the first few hours of birth. Unfortunately, there are mothers with extremely vulnerable hospitalized babies (preterm birth, birth defects) are unable to provide adequate amount of breast milk to support their babies; or there are mothers that generally cannot produce enough breast milk. With the increase of Internet usage and online shopping, people have started to sell breast milk online. 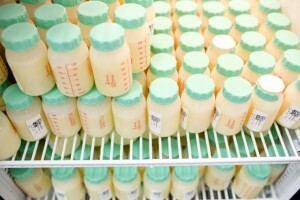 An investigation done by the “BBC Inside Out” program took 12 samples of online bought breast milk around Europe for microbiological tests at Coventry University. The results showed that four of the samples contained pathogenic Escherichia coli, two of samples contained candida and one contained pseudomonas aeruginosa, which lead to death of four infants in neonatal units in Belfast in 2012. Even though the investigation had very small sample size, the test result indicated that online breast milk has the potential of containing pathogenic bacteria. Infants have immature immune system and devoid of natural gut microflora, which make them the most vulnerable population that has the highest risk of being infected by pathogenic bacteria. Small amount of pathogenic bacteria can cause severe illness or death of infants. Thereby, online breast milk from unauthorized websites should be banned to prevent foodborne illness from happening on those fragile babies. In Europe and other parts of the world, there are many authorized Milk Banks that offers pasteurized breast milk for premature babies or babies recovering from surgeries. To ensure the safety of donor milk, serological screening, medical history and lifestyle are done and checked before receiving donor milk. According to the European Milk Bank Association (EMBA), there are 210 active milk banks around Europe to support infants that need safe breast milk. A study on nutrients and bioactive factors in human milk indicated that heating process like pasteurization does have a certain degree of destruction on the functionality of bioactive protein components. However, it is not worth the risk of feeding infants with unknown source breast milk that is potentially pathogenic. Despite there are no outbreaks caused by E.coli in online sold breast milk, preventions should be done to avoid such incidence from happening. I personally think that it is not a wise choice to purchase breast milk online as the milk source is not known and you have no idea if the breast milk is properly processed and pasteurized. With online shopping nowadays, it is difficult to determine the authenticity of the item and this applies to breast milk as well. Food fraud is more likely to happen online as the buyers are convinced based on the description and pictures given without seeing the real product. Also, even with proper pasteurization, breast milk still stands a chance of being contaminated with improper packaging, storage and delivery. Therefore, to avoid infants risking their lives for breast milk that might endanger their lives, it is best for local authorities to restrict the sales of breast milk on an online platform unless it is properly authorized. I’d say this is a brilliant angle for the food safety issues! As online shopping is becoming increasingly popular and everyone enjoys its convenience, lots of home prepared food come to the market without proper processing method, which might lead to lots of potential food safety issues. Nowadays the inspection agency should pay their attention to those online sources as well. Online shopping is a new angle for the food inspection agency to consider. Online shopping is becoming increasingly popular currently and we all enjoy the convenience. However, this also bring about a lot of home processed food and even things like breast milk, which poses a significant threat to food safety. Although it might be hard to regulate the selling of all those types of food online, the authorities should pay more attention to the food that potentially have more significant impact and probably ban the sales. For example, online breast milk are used to feed infants, who do not have a complete immune system yet. While by consuming contaminated foods normal individuals might only get mild symptoms, infants are very fragile and might get very severe problems. I also agree that purchasing breast milk online from an unknown stranger is very dangerous. If they were purchasing or receiving the breast milk from an authorized source such as a milk bank then it would be different because it technically should be treated and handled by professionals hopefully. I understand that some new mothers are unable to give their newborns enough breast milk and decide that the only way their babies can get benefits of colostrum is from other new mothers, but they have to understand that there are lot of risks associated with this. The mothers selling the breast milk may not even know that the milk contains harmful pathogens and since they are not trained on ways to keep breast milk safe through the packaging, handling and storage process, they really should not be selling it. Interesting article! Since breast milk comes from our own human body as a natural source of food for our babies, it’s understandable how some people can overlook the safety factor. Majority of the population may assume that since it’s a natural source, and under normal conditions, it would be fed straight to the baby, there will be no health hazards associated with purchasing breast milk from another source. I also agree that even though there are no reported outbreaks, preventative measures should be implicated to avoid its occurrence. Setting out regulations for the sale of breast milk would be a good solution to manage its distribution. However, regulations can only manage so much and the distribution of breast milk can still occur in secrecy. I think it will be important to educate mothers that are planning to either buy or sell breast milk. This will allow both sides to understand the risks associated and be more cautious about the breast milk they’re handling with for babies. Really interesting article. I had never thought about breast milk being a possible source of bacterial contamination as it usually goes directly from mother to baby, therefore minimizing the risk of cross contamination. I think it is great what is being done in Europe with having the Milk Banks that supply safe and fresh milk to babies who are in need. It is a great alternative for Mothers who want to supply breast milk to their babies but cannot do so for a number of reasons. I think it is very unsafe for breast milk to be sold online without any regulations or screening. I agree with Elaine Chan that it would be a great idea to educate mothers that are considering buying breast milk online. I believe if many of these mothers knew the health dangers associated with infants and bacterial contamination of foods that they would reconsider the purchase of breast milk from an online source. I think purchasing human breast milk from unauthorized online stores is not wise at all. Newborns’ immune system is not nearly as effective as an adult’s or even an older child’s, and that it takes many months before a newborn can fight off infection as well as someone whose immune system is fully matured. Breast milk provides the babies with an added level of immune protection, because it contains large numbers of antibodies and other infection fighting cells, but it must be not pathogenic in the first place. It is very nice that these authorized Milk banks can provide safe breast milk, but if the breast milk has already been pasteurized, is it still providing those unique antibodies for the baby? Comparing to the commercial formula, is the pasteurized breast milk still much more beneficial for the newborns? I’m thinking that during the transportation or storage, there might be other contamination. A really interesting article! Taking into consideration that breast milk is highly recommended as the primary food source for infants and that infants have a unestablished microflora it seems counterintuitive that breast milk would be a source of illness/death. However, purchasing dairy products online, seems rather unwise. We have learnt the importance of proper sanitation/ processing at various stages of the food processing/distribution continuum and that failing to do so can lead to serious harm. When buying products online, especially with low shelf-life foods, it is critical that they be stored (before/after/ during transport) at the correct temperature and treated appropriately. In knowing this, it should raise a red flag to potential consumers that plan on buying such products online (unauthorized online stores). On the other hand, the presence of Milk Banks, serve as a safer alternative, and make breast milk more accesible to those who perhaps can’t provide this to their infants. In my opinion, I would never risk my baby to consume breast milk from another unknown source even if breastfeeding has many positive benefits to a baby. I think it is better to provide baby formulas which ensure of containing all of the nutrients that a baby needs as well as safety of the baby. 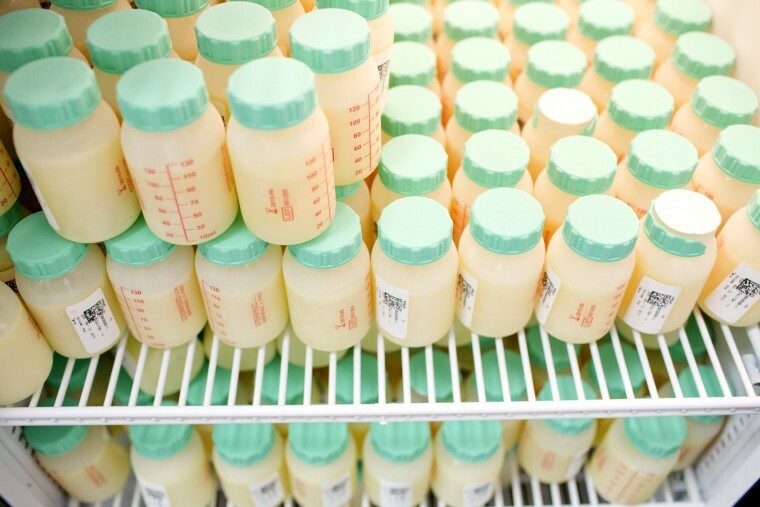 Even if the breastmilk to be sold had been free of bacteria may become contaminated through out the process of transportation to handling of the milk. There is so many other factors that needs to be supervised which cannot be done online. On the other hand, the milk bank that provides pasteurized breastmilk that confirms safety seems like a better approach in allowing women who lack the ability to breastfeed to be able to give breastmilk to their child. However, as mentioned in the summary of article, the first thing that came to my mind was nutrient content of the pasteurized milk. I remember one of the article on this blog talked about raw milk to be more nutritious and beneficial to the body than pasteurized milk although it does have negative consequences such as presence of bacteria. Nevertheless, this evidence indicates that pasteurizing milk does in fact reduce the nutrient content of the product. This being said, I would rather feed baby formulas which compensates women who cannot breastfeed to be able to give their children the nutrients that they need. The article is really interesting! As online shopping is becoming more and more popular and convenient, people can buy almost whatever they can think of via the internet. However, I won’t buy food from any unauthorized sources online especially for vulnerable populations such as babies. I think in order to prevent people from risking their babies’ lives, it is more important for the government to make the authorized Milk Banks more available rather than just regulate online shopping environment. This article about breast is brings up interesting concerns as there is an increasing demand for these types of products. Whether or not people feel that selling breast milk is controversial does not take away from the fact there should be some sort of system to ensure the safety of these products. Since the breast milk is supposed to benefit babies, there should even more emphasis on ensuring that these products are not contaminated with foodborne pathogens. Breast milk sold online are sold at higher prices because of its claimed benefits and limited supply, therefore it should go without saying that consumers of these products would not mind if they paid a little more to have the milk tested before going on the market. This is such an interesting post! I had never considered breast milk to be a potential source of foodborne pathogens before reading this. As babies have not developed any sort of immune system or gut microflora this is something that should be of major concern. Selling un-testing breast milk online creates a huge risk factor for the health of the baby and I dont think it should be done without pasteurization techniques and testing. For mothers who cannot produce their own breastmilk the milk banks are an amazing alternative to providing their baby with the nutrients and introduction of microflora compared to the alternative of formula. Although there is a degree of uncertainty when you use the milk from the banks as the milk is coming form an unknown source, with the proper use of sanitation, preparation and storage it provides a great opportunity to babies to get the all the benefits even though it is not coming from their mother directly. This article gives an interesting insight to the issue of breast milk banks online. While the intentions may be good, buying breast milk from online sources really is a flashing red light to me. Multiple dangers may come with breast milk purchased from the internet, most importantly, health and safety risks for your baby. Each step of the collection, processing, testing (if any), and storage of breast milk may introduce a route of entry for pathogen contamination. Even if they are said to be pasteurized, you have no way of ensuring the process will eliminate all pathogenic factors in the breast milk. Moreover, the FDA recommends against feeding babies with breast milk acquired directly from individuals or through the internet. While understanding the need for alternative sources of milk for those who cannot breastfeed, personally, I believe the risks to infants’ health and safety outweigh any benefits that they may get from breast milk. Many types of formula are available for babies with medical conditions and may be the better alternative. I think it is absolutely disgusting that people would purchase breast milk ONLINE for their infants. What is wrong with people? This activity should be completely banned and illegal. To me, this is equivalent to purchasing blood, kidneys, and other miscellaneous organs online. Why would people want this? I’m flabbergasted. “Recommendations” to not purchase online break milk from the FDA and other authorities are not enough. They should make this a criminal act. Especially if one day, by chance, death does occur from consumption of this product. Because, killing someone is a crime! Intentional or not! In my opinion, since breast milk is considered to be the “gold standard” for infants, the intention and the availability of breast milk banks is wonderful. However, because the breast milk from the the milk banks are for vulnerable infants, milk bank facility should be run by under government authorities to ensure tight regulations. The facility should be able to provide health information of the donor mother for the safety of the consumer. I think breast milk bank provided another option for very vulnerable infants who are not taking formula well, but something like breast milk shouldn’t be order online and have it mail to you. The process of shipping may introduce more risk factor of the breast milk which can be life threatening to infants. Great article and I remember we discuss this in class. I think nothing is better than breast milk to infant, however, food safety is very important as well. Like local farm market, I think government will have a hard time to control online selling as they are too “scatter” to track unlike large industrialize production. I think starting a register program and also recommend people to provide milk to such program are a great start since breast milk becomes more and more popular over formula. Anyway, I learn a lot from this post!